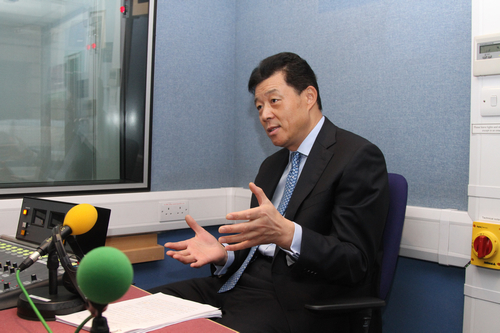 On December 20, Ambassador Liu Xiaoming gave a special interview with Philip Dodd, a well known presenter, at the studio of BBC Radio 4. 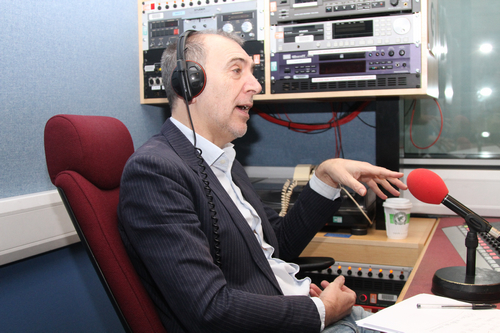 He talked about the meaning of the giant pandas in Britain and the China-UK relations. Dodd asked: why giant pandas are so important to China? Are the giant pandas a “big present” from China to Britain? Ambassador Liu said that giant pandas are China’s “national treasure” and an endangered species in the world. As they are not pregnant easily and are not good at taking care of their cubs, wild giant pandas are in a small number. To save and protect giant pandas, the Chinese government adopts many measures in policy making, legal construction and capital investment. These have helped to constantly improve the protection of this species. But even so, the population of wild giant pandas is only about 1600. Ambassador Liu said that the coming of giant pandas to the UK cannot be simply regarded as a "present". It is an important scientific research project of China-UK cooperation and covers various fields such as field ecology, artificial breeding and rearing of giant pandas and study in cognition evolution and behaviour of giant pandas. Although many giant pandas came to Britain in history, they never gave birth to a baby in this country. The Ambassador hoped that the cooperation of both Chinese and British scientists would help Tian Tian and Yang Guang to produce baby pandas as soon as possible, bring new results in the China-UK giant panda researches and further facilitate the release of artificially raised giant pandas into the wild. Dodd asked: what is the message given by the giant pandas to the rest of the world as China's "image ambassador"? Does China believe that the coming of giant pandas to the UK will help to enhance China's soft power? It is estimated that by 2020, China will have 600 million middle class people and will become a true superpower. As Europe is deeply mired in the debt crisis, does China think that the affection of the western countries on giant pandas is out of their interest in expanding the Chinese market? Ambassador Liu answered that with their distinctive black and white colours and lovely look, giant pandas are very popular among the people both in China and in the world. The messages brought by the giant pandas to the UK can be condensed in 3 Ps: Panda Conservation, Public Awareness and Peoples Friendship. The first aim and task of the cooperation on giant pandas abroad is to the study in the reproduction and survival of giant pandas in artificial and natural environments; The second purpose is to disseminate the knowledge on giant pandas, so that foreign people can have a close look at them and directly learn about them, and then love giant pandas more and support the protection work; And third, it is to enhance the friendship between the peoples with the pandas as a messenger. Tian Tian and Yang Guang’s settlement in Edinburgh will be a tie for China and the UK to enhance mutual understanding, deepen friendship and expand cooperation, and will be a new story of the friendly exchanges between the two peoples. It is impossible to learn about giant pandas without understanding their hometown - China, China's culture, history, economy and society, the path of peaceful development pursued by China today, the country’s will of achieving mutual benefit and win-win situation with the rest of the world, and the enthusiasm and kindness of the Chinese people who are ready to get on with the people of other countries. To promote the friendly exchanges between the youth, the Chinese Embassy is working with some British universities to organize speech and painting contests revolving around giant pandas in 100 primary and secondary schools across Britain. The top prize winners will have an opportunity to visit the hometown of giant pandas – Sichuan, China. Ambassador Liu said that China welcome foreign economic cooperation with open arms. It is true that China has made remarkable achievements over the past 30 years, but it is quite an overestimation to say that there will be 600 million people in middle class in China in 10 years. China's per capita GDP is still ranked over 100th in the world and there are 100 million Chinese people still living under the poverty line defined by the United Nations. China will remain a developing country in quite a long time and the country has still a long way to go in its development. It has been over 30 years since China's reform and opening up and 10 years since its WTO accession. China has an increasingly open market, and in the future, China is willing to expand the mutually beneficial cooperation with the rest of the world including Britain to achieve common development. Dodd asked: Do you think the West does not know China well enough? Ambassador Liu said that enhancing understanding is a two-way street. The Chinese people should tell more about China to others and share its success story with the rest of the world. At the same time, the Western media needs to have a comprehensive and objective coverage on China and display China as it is. They need to let the Western public see that China's achievement is not limited to economy. Our success owes much to an all-round development and progress in politics, society, culture and other aspects. The Ambassador hoped that China and the West would work together to encourage a more comprehensive knowledge on China, and that BBC would make active efforts to this end. BBC Radio 4 is a current affairs information channel oriented to the intellectuals and urban white-collar class. The station will produce a British broadcast documentary with the coming of giant pandas to the UK as the theme to explore its meanings in the cultural, economic and diplomatic aspects. 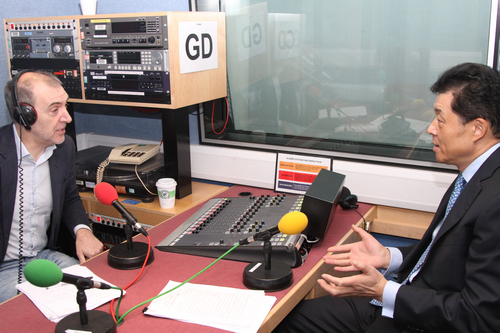 This interview with Ambassador Liu will be broadcast across Britain next January.